What's a dominant 9th chord ? 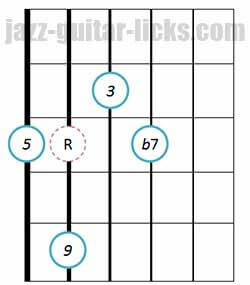 Learning dominant 9th (or simply 9th) guitar chords is a logical continuation to dominant seventh chord study. 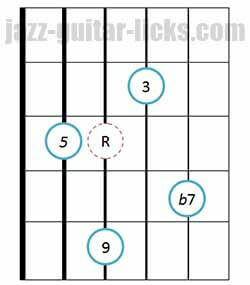 Theoretically ninth chords are built with 5 notes called root (1), major third (3), perfect fifth (5), minor seventh (b7) and ninth (9). We will see that it is quite unusual to play these five notes together on the guitar. 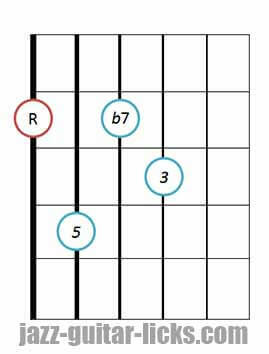 As it is shown in the chart below, a dominant 9th chord is simply a dominant seventh chord with a ninth added. 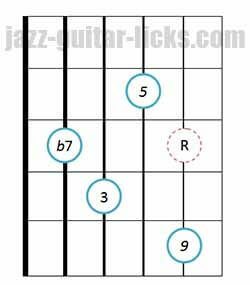 You can substitute any dominant 7th chord by a dominant 9th (9) chord. 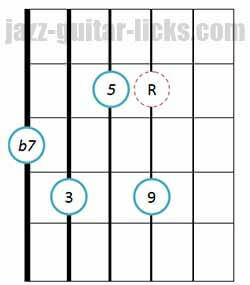 This way it adds a little more interest to the sound indeed, 9th chords can helpcreate a more sophisticated and cool sound to your guitar playing. 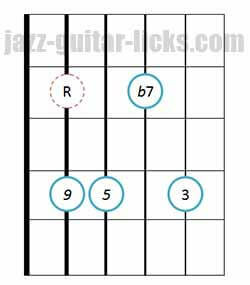 These are great chords for blues, funk and jazz. 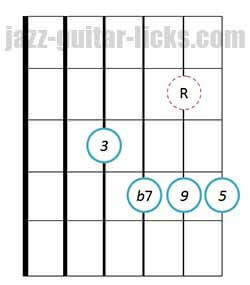 They naturally occur on chord V in the major scale and is the only type with both a 7th and 9th. 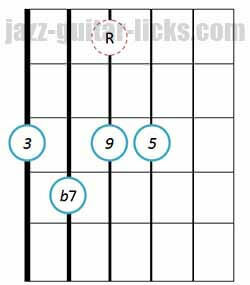 Just as the dominant 7th chords which are marked with a 7, dominant 9th chords are simply marked with a 9. Example with C9. 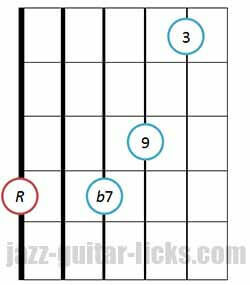 Before starting to learn drop 2 dominant 9th chords and their inversions, here are three basic guitar positions whith roots in the bass to familiarize yourself with these chords. Please note that the first and third diagrams have no fifth. You can eventually omit the fifth of the second diagram if you don't want to bar with your third or fourth finger. 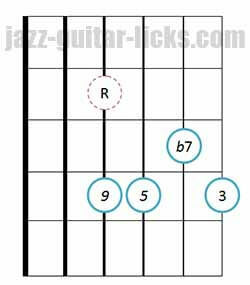 When you play complex guitar chords, it’s not always possible or practical to include all chord tones. 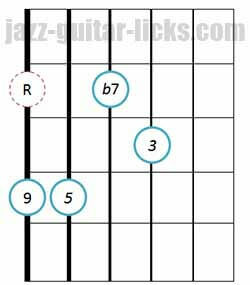 So, you often leave some chord tones out. 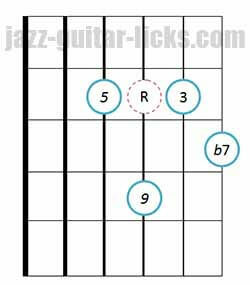 When building 9th chords, you just have to take a basic 7th position and replace the root with the 9th, which is found a tone (two frets) higher on the guitar fretboard. 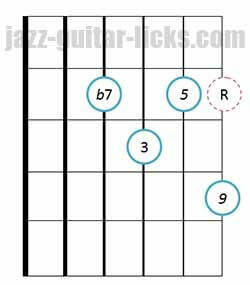 This is what happens with these two diagrams that show the relation between a dominant 7th and dominant 9th chord. All the diagrams presented below omit the roots (R). However, it is important to locate them even if it they are not played. This is why root notes are dotted in red in the diagrams. 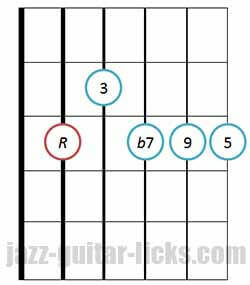 This will allow you to find more easily the chord name. 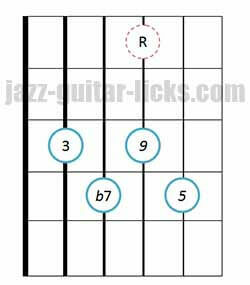 The following guitar diagrams are based on dominant seventh drop 2 voicings but with no roots. 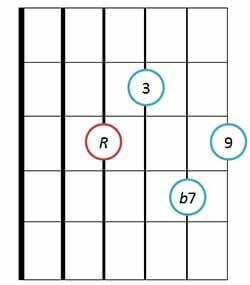 You can take a look at this lesson to understand how drop 2 chords are built.